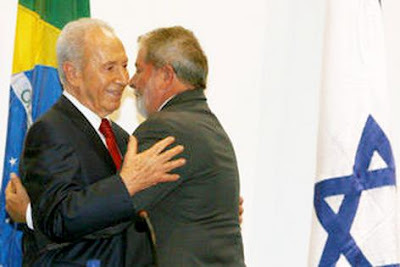 Marcos in his report says that Lula is an "Illuminati" parrot but forgets to say that everyone in Brazil (consciously or not) became an Illuminati-Jew zombie because Jews control the Federate Republic and the Central Bank since its birth. Jews control the press and Jews control the TV since a long time ago. No one can escape from this kind of mind cage. It is much more brutal and much more mind boggling than Russia ever was. Reinaldo Azevedo (left) is a worker of a Jew publication (namely "Revista Veja", an anti-Catholic resonance chamber since its birth) and lives (you guessed) among Jews in a Jewish and very rich neighborhood at São Paulo city. And he appears to defend some homosexual ideas too. Of course, as Olavo de Carvalho, he is also a "remorseful" past Communist. What these two actors hide from their poor (although many times well intention-ed) readers is that the Jews are the founders and the controllers of socialism. Karl Marx was a Jew and was trained by a Jew named Moses Hess as were 90% of the European socialist activists and intellectuals. They control the modern Republic through banking and usury. So, the inexplicable space and liberty that a traitor, subversive and dangerous organization such as the "Forum de São Paulo" had to act for such a long time is never explained to their readers. They try to figure out why these people are not just simply arrested and judged as criminals but they never get the answer. Why Lula never answer for their crimes? Why the armies and even the Church (or the Fifth Column in the Church as Pinay brilliantly writes) don't denounce and act against this villains? Do any Christians ever heard about this monstrous crimes on the so-called "History" books? No. What they are "taught" on the schools by the "teachers" is that the Catholic Church persecuted "innocent people" (sorcerers, magy and witches like those that practiced the Cabala teachings) during the middle-ages. What they are "taught" on the schools by their teachers is that the most monstrous and imaginable crime ever committed in human history was during WWII by the Germans against the poor Jews. Do any Christians ever heard of Jews sentenced to death penalty on the so-called "International courts" by the crimes that murdered millions on Soviet Union or western Europe countries? Did Christians notice movies oi the theaters talking about these crimes? Because he receives money from the Jews in São Paulo as much as Reinaldo Azevedo does. He writes for a JewISH newspaper in São Paulo (namely "Diário do comércio", a kind of newspaper dedicated for the traders in São Paulo). A well studied and well educated man like Olavo de Carvalho is aware of this fact, of course. He is not sinning by ignorance: he is sinning because he is intended to lie and hide true and well intention ed Christians (especially the Catholics) from the fact that they are in imminent attack of a Jew mass murder revolution.